November 8, 2018 – The 2018 Southern Living Idea House received a Texas-sized makeover, thanks to help from the Overhead Door™ Brand who helped restore charming curb appeal to the 3,500-square foot Austin home. The Southern Living design team chose Overhead Door™ Courtyard Collection® Model 161A with white paint and Stockbridge windows to help bring the Southern-esque facade to life. 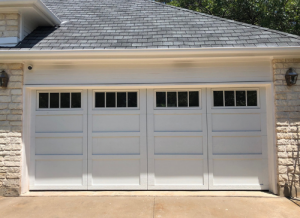 Overhead Door Company of Austin™ installed the garage door, which is made with the durability of steel but boasts the beauty of wood, complementing the home’s soft and simple features. “For many homes, the garage door is the largest exterior feature and one that has the biggest potential for achieving that curb appeal ‘wow’ factor. On top of that, an updated door can earn a 98 percent return on investment — the highest of any home improvement project nationwide,” said Ali Isham, Director of Marketing at Overhead Door Corporation. As more people are choosing to stay put and remodel their homes, Southern Living wanted its big renovation project to serve as a source of inspiration. Homeowners can turn to the Idea House for the best home appliances, designs and technology, thanks to designer Meredith Ellis of Meredith Ellis Design and James Showroom, architect Chris Sanders of Sanders Architecture, builder David Wilkes of David Wilkes Builders and landscape designer Big Red Sun.